Mystic buys a lot of stamps. In fact, there are times when we’re unable to sort through them all. So as a special treat, we separate these giant lots by weight and sell them at a discount. 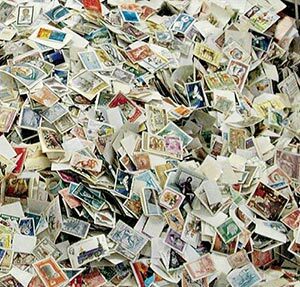 Each package of worldwide stamps is unsorted – there’s a huge variety. A half-pound package can hold anywhere from 1,200 to 3,000 stamps. Completely unsorted – you may find some duplicates or damaged stamps. However, you may find desirable stamps. You never know and that’s half the fun! This is an extremely inexpensive and fun way to get a lot of worldwide stamps fast.